While there have been no real details announced by the Chrysler Group about the 2014 SRT Viper, an insider who spoke with Allpar explained that production of the new model year will begin in July. This comes as no big surprise as many model year changeovers come during the summer shutdown but what does come as a surprise is that the Viper’s Connor Ave production facility will not take summer downtime and the workers will build around 3,000 vehicles for the 2014 model year. This news contradicts comments made by Chrysler Group brass including SRT President and CEO Ralph Gilles who has stated that the company will build around 2,000 Vipers per year. This decision to build 50% more Vipers than initially expected comes as the company works to meet the high level of early demand and Allpar reports that the 2015 model year will drop back down to 2,000 units per year. 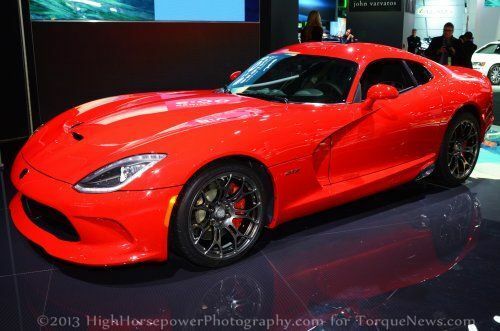 We do not know what changes are expected for the 2014 SRT Viper other than the addition of the limited production Viper TA but Allpar’s insider has offered up an early look at the colors expected to grace the2014 Viper and Viper GTS. The 2013 Viper is available in 6 colors (Shadow blue pearl, Adrenaline red, Race yellow pearl coat, Black venom, Bright white clear coat, and Gunmetal pearl) while the Viper GTS adds two unique colors of its own (GTS Blue Pearl, Stryker Red Tinted Pearl Coat). For 2014, it looks like SRT will offer 8 colors with 4 returning from 2013 (Adrenaline red, Gunmetal Pearl, Venom Black, and Race yellow pearl coat). Bright white clear coat, GTS Blue Pearl, Stryker Red Tinted Pearl Coat and Shadow blue pearl are gone for 2014 with Viper White, True Blue Pearl, Billet Silver Metallic and Stryker Green Tri Coat (GTS only) taking their place. It will be interesting to see if True Blue Pearl is a similar bright blue shade to the current GTS Blue Pearl and if Viper White is similar to Bright white clear coat. Also, we will have to wait and see if True Blue is unique to the Viper GTS or if the “base” Viper can also order this new blue hue. I would expect that Stryker Green Tri Coat will look great on the 2014 Viper GTS and a bright silver metallic makes good sense as silver is one of the most commonly chosen colors in America. Of course, there is also the bright orange paint scheme offered on the new 2014 Viper Time Attack. We can also likely expect some stripe packages but it is unclear whether they will continue to only be available for the Viper GTS as they are for 2013 and if only black, silver and gun metal stripes will be offered for 2014. Considering that there has been no new competition for the new Viper introduced over the past year, we very much expect that the V10 engine will remain unchanged with 640 horsepower and 600lb-ft of torque. It is widely expected that the SRT Viper American Club Racer (ACR) could offer more power than either the base Viper or Viper GTS but with that ultra high performance model not expected to arrive until sometime during the 2014 calendar year – the vast majority of the 2014 Vipers built will feature a very similar drivetrain to the mighty V10 current at work in the 2013 model year Vipers.